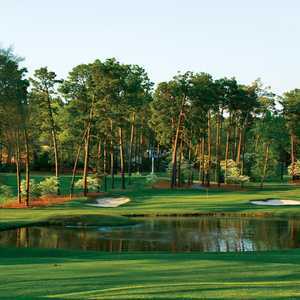 Foxfire Golf & Resort just outside Pinehurst, NC exemplifies what Sandhills golf is all about. Tree-lined fairways, large elevation changes and lots of sand is what you’ll find on either of the Gene Hamm designed 18-hole championship courses. Golf Digest has awarded Foxfire Golf and Resort 3.5 stars in their Places to Play Guide. 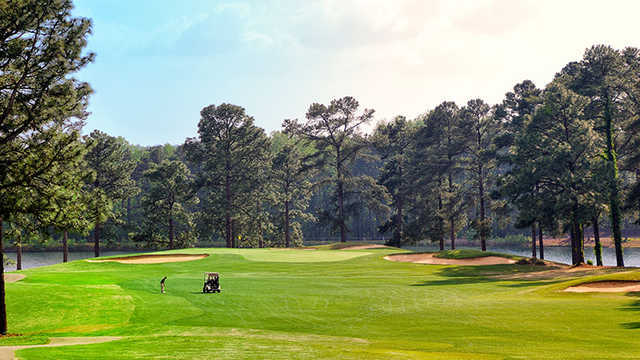 The fairways on both the Grey Fox and the Red Fox courses follow the natural contours of the land and play through natural rolling hills, sandy soil and multiple lakes. Players must avoid numerous strategically placed bunkers and natural hazards as they make their way up – or many times down - to large, elevated greens. The Grey Fox Course plays 6,781 yards from the back tees with a course rating of 72.9 and a slope of 130. Most golfers will have all they can handle from the White Tees (6,294/70.6/128). Grey Fox is considered the tougher of the two Foxfire courses, although the slope says otherwise. It emphasizes the need for shot placement rather than length although from time to time, a long drive doesn’t hurt. It is certainly the hillier of the two courses, as can be seen standing on the first tee, a long sweeping dogleg right around a lake with pine trees waiting to hinder anything errant. The first hole plays 511 yards from the White Tees and is the #1 handicap. It’s a 3-shot hole for just about anyone. Your tee shot plays downhill to a very small landing area unless you hit it short of the water. The next two shots play uphill; get used to it. Your layup is of the risk/reward variety; choose the right club and distance to leave it in the narrow fairway, short of the strategically placed fairway bunkers. Then it’s a short pitch shot to an oddly triangular green. A front pin placement can be tricky as it will be closely guarded by bunkers on either side. Par is a good way to get started. Number 6 is the only hole that requires a long carry over water – you’ll need to hit to about 200 yards; don’t get cute and try to cut off too much or you’re likely to find the water. At only 345 yards (White Tees), a good drive and good pitch can result in a good score. Number 11 is a very narrow hole that plays 389 yards (White tees) with trees framing either side of the fairway and a lake that comes into play on the right about 110 yards from the green. It will take a well-controlled drive and approach shot to reach this triangular green, well protected on the left and back with bunkers. Sixteen, seventeen and eighteen are a challenging trio of finishing holes. 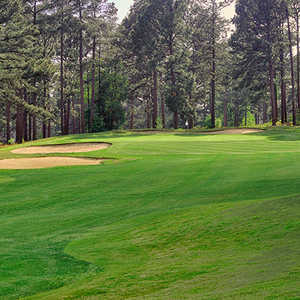 Sixteen (483 yards/White Tees) is a narrow par 5, that, with a good drive is reachable in two. Just be careful of the three traps that surround the green. The par 3, 17th plays 153 yards (White Tees) and has bunkers guarding the front left and back of the green as well as a large oak tree if you push it too far right. The green is 31 yards deep so picking the right club is important. The finishing hole is a dogleg left par 4 that plays 394 yards - and all of it. Play down the right side to leave the best approach angle into a small green that is well protected by sand. It’s a great hole to end a fun and exhilarating round. Once upon a time, the Hamm courses at Foxfire were considered two of the best in the area. Now, Brown Golf Management is working to restore these courses to their former glory. Both courses offer a challenging but fair opportunity for you to experience Sandhills golf at an affordable price. 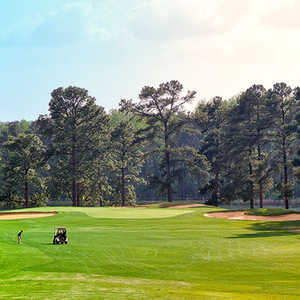 Brown Golf Management is offering some incredible membership opportunities that give members access to both of their 36-hole Pinehurst facilities – Foxfire and The Country Club of Whispering Pines. As a member, you’ll receive unlimited golf, full access to the practice facilities including unlimited range balls and full access to other Brown Golf-managed facilities in NC, SC, FL and PA. All for one low, monthly rate. 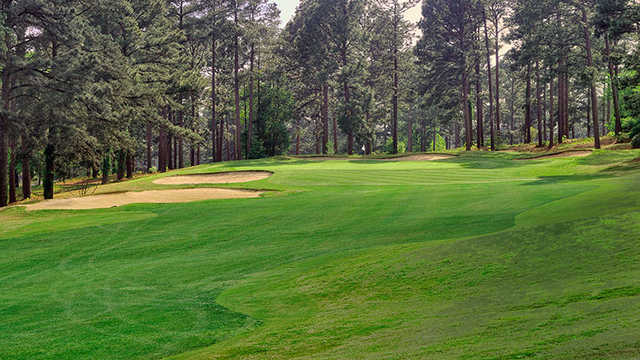 Foxfire and Whispering Pines also offer stay and play packages that include accommodations, golf and meals. 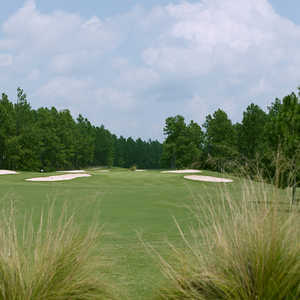 For more information, visit their website at www.foxfireresortandgolf.com.